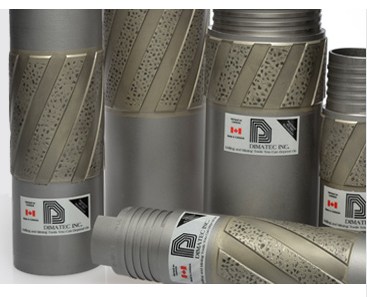 This category of products is intended for use in wireline core barrel assemblies that are used in mineral exploration applications. Their purpose is to assist in minimizing the degree of drill hole angular deviation in target or deep hole drilling situations. The increased stability that these products provide will result in less vibration, a straighter drill hole and better core recovery. These tools are used in place of conventional blank or plasma spray coated adapter couplings and locking couplings. These tools are used to provide stabilization to the back-end of the core barrel assembly.